Danganronpa is a franchise that I was oblivious to prior to this review, but this is definitely an IP that I have quickly started to crave more of. However, while there’s plenty to enjoy in this instalment, there’s also plenty that holds it back. 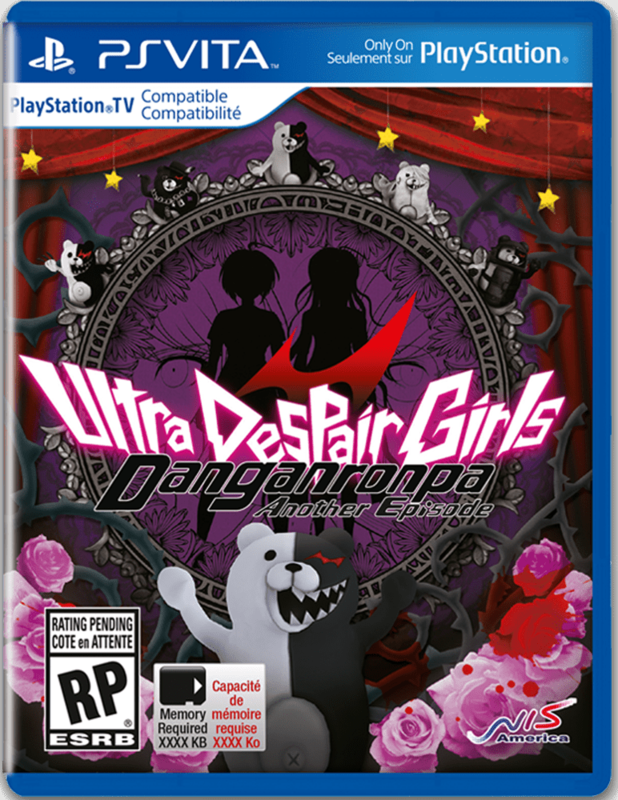 Because I’m not familiar with the previous Danganronpa videogames, and I’ve yet to watch the anime (though I will now, since I’m so intrigued by the universe that’s been created), I’m forced to consider Danganronpa Another Episode: Ultra Despair Girls as its own entity, rather than how it fits into the already-established property. As it happens, this game is the first in the franchise to consider itself a third-person-shooter of sorts, so maybe that’s not such a bad thing. The story focusses around Komaru Naegi, a high-school-aged girl who has been imprisoned for a year in a locked room by unknown captors. Sparing the details, she is freed and comes to find that the children of the pseudo-utopian island she inhabits have banded together to eliminate the “demons”. As it turns out, the demons are the adults (anyone older than a middle-schooler, in fact) of their lives who seek to “control” them. 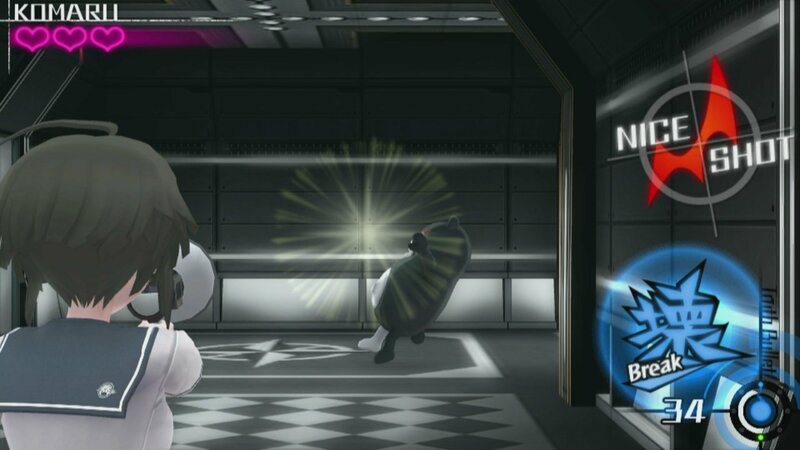 The children attempt to create their version of a paradise city without adults by unleashing giant robotic bears called Monokuma, which serve as the bulk of the fodder in the game—albeit with numerous different variants. The children are led by a group of five, calling themselves the Warriors of Hope. While each member of the group has a title, alluding that they see themselves as a traditional RPG-style adventuring group, and a nickname variant of “little ultimate (insert school subject)” (because, kids), it’s not quite the Lord of the Flies meets Children of the Corn I was expecting. While the Warriors of Hope treat the hunting and murdering of anyone older than them (Komaru included) as playtime, it’s clear that all is not as it seems. Sadly, the twists that unfold in the plot are a bit… childishly predictable. That said, the art style is truly captivating. All of the adults in the game—save for main characters—are vibrantly coloured in pinks and blues with no discernable features. There’s a real morbid beauty to seeing colourful figures nailed to walls or being danced on by faceless children. 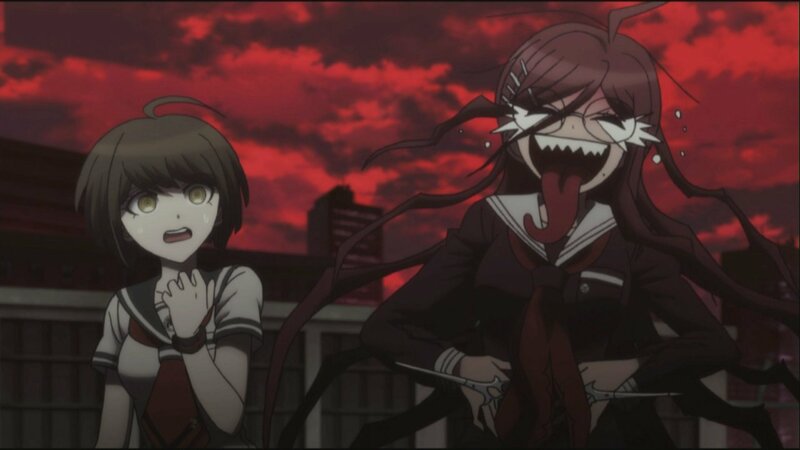 Komaru’s companion Toko is also a great character—particularly when you let her sociopathic scissor-wielding alternate personality Genocide Jack out to play. To top it all off, the fully-animated cutscenes are stunning. 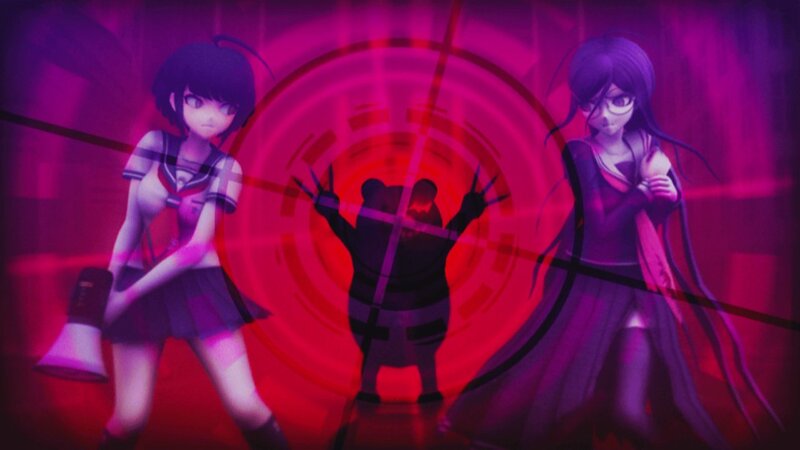 The game also features plenty of unlocks and upgrades for both Jack’s scissors and Komaru’s hacking gun (it’s a megaphone that shoots virus code that can affect Komaru, as well as other machines, because, *shrugs*). In addition, there are plenty of extra goodies to track down for lore-hunters and completionists, and each chapter gives a rating based on your performance, number of retries, and a couple other hidden factors, so there are plenty of reasons to re-play. Sadly, while there are plenty of reasons to re-play, it may be difficult to simply keep playing in the first place. The game suffers from some real pacing issues, and I feel like the 20+ hours of gameplay would have been better condensed into half that. The controls are also a complete mess. The Vita simply doesn’t lend itself well to a game that uses both sticks, both shoulder buttons, and the shape buttons while still having to maintain a grip on the system itself. In addition, the aiming is disaster. The aim control manages to be far too sensitive for the kind of pinpoint aiming the game both demands and rewards, yet sluggish and cumbersome when exploring. The over-sensitivity of the low end is exacerbated by the decrease in field of view while aiming—effectively doubling the sensitivity. These don’t seem like immediate problems, but once an enemy is within six paces or so, it’s easy to waste all of your precious ammunition without even hitting it. And don’t forget that running away isn’t easy either, as most people don’t have enough hands to use both thumbsticks, the shoulder buttons, and the circle button to sprint at the same time. There’s a special place in hell reserved for developers that burden players with this and then fill the game with tight, closed-in boss battles with fast enemies, or even trash fights with fast enemies that will have you accidentally backpedaling to zone-load areas that effectively waste all the ammo you’ve expended in a fight. But for all the pacing and control issues, as well as frequently being treated as though I can’t solve my own puzzles in a game made for adults, it’s still a game I highly enjoyed. If you can bear (see what I did there? 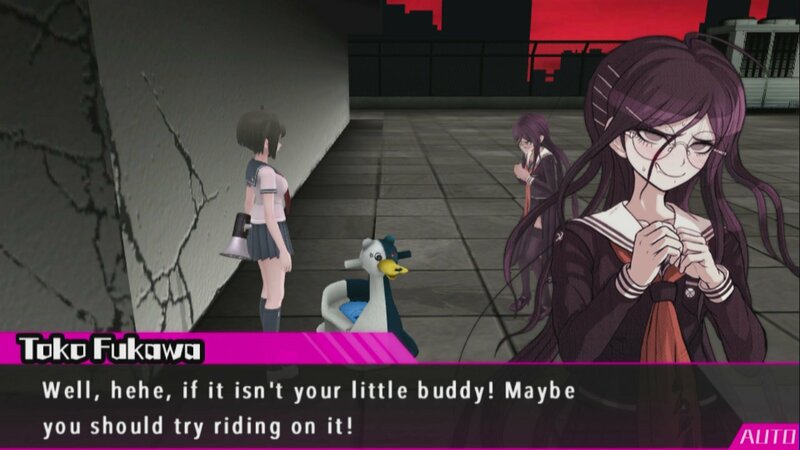 This parenthetical statement exists only to illustrate how frustrating it is when someone draws attention to the obvious under the assumption that you couldn’t manage it for yourself, thus breaking up the flow) with it, Danganronpa Another Episode: Ultra Despair Girls is still, if nothing else, a memorable experience. But for all the pacing and control issues, as well as frequently being treated as though I can’t solve my own puzzles in a game made for adults, it’s still a game I highly enjoyed.